One of the hosts of Two Hundred A Day. Independent game designer and publisher of games. Nathan Paoletta has hosted 47 Episodes. Nathan and Eppy discuss S2E1, The Aaron Ironwood School of Success. When Jim's former foster brother turns up in L.A., it's not just to promote his business empire; he has a problem and he needs help. It turns out that Jim may trust Aaron just a little too much as he's brought into a swindle, and has to figure out the angle before it's too late! The chemistry on screen elevates this episode over a slightly illogical script, and the psychology of the action sequences give us a lot to talk about in our second half! Nathan and Eppy discuss S1E20 The Four Pound Brick. An old friend of Rocky's is convinced that her cop son's death was no accident, and Rocky hires Jim to look into it! A straight-forward detective mystery written by pulp author and screenwriter Leigh Brackett, we find the combination of genre conventions and iconic Rockford Files characterization to be well worth the watch, and it gives us a lot to talk about in our second half as well! Nathan and Eppy discuss S4E10 Hotel of Fear. Angel gets into serious trouble when he witnesses a murder, and Jim needs to look sharp to keep him out of the literal line of fire! This episode deftly handles multiple mysteries while showcasing all of the things we love about both Jim and Angel, giving us a lot to talk about in our second half about crafting characters in fiction. A solid recommendation from us! Nathan and Eppy discuss S4E7 Quickie Nirvana. Rockford's hippie acquaintance Sky Aquarian draws him into a serious problem with a former employer, a blackmail scheme and a bunch of money. A wonderful David Chase script gives us all of juicy characters, good gags and fun mystery-solving action we love so much in the show, and much fodder for talking about how to demonstrate character through actions in our second half. We really like this one! Nathan and Eppy discuss S2E15 The No-Cut Contact. Rob Reiner guest-stars as a "second rate quarterback on a third-rate team" who nevertheless drags Jim into trouble, caught between the Mob and the Feds. Can Jim figure out what's going on before "King" Sturdevan pins the whole deal on him? We break down how the chemistry of the leads and our beloved tight writing make this a great episode to watch, and go over protagonism and MacGuffin's in the second half. Highly recommended! Nathan and Eppy discuss S1E21 Just By Accident. This episode keeps the action moving along as Rockford investigates the death of a friends son, a Demolition Derby driver, in a mysterious accident - unfortunately, the writing overall and the treatment of Rockford in particular doesn't meet our generally high expectations! We break down the missed opportunities in the second half, as this episode left us wanting better choices made on behalf of our friend Jim. Nathan and Eppy discuss S3E12 There's One in Every Port. Rockford thought he was helping out a friend, but it turns out he was conned! Now he has to assemble a crew, turn the mark and con his "old friend" Eddy in order to pay back the mob - before time runs out. This is a wonderful con game romp of an episode! Nathan and Eppy discuss S3E2 The Oracle Wore a Cashmere Suit. A self-proclaimed psychic is assisting the police with a missing persons case, and takes a keen interest in what Jim has to do with it. A wonderful performance from Robert Webber as "psychic" Roman Clementi adds to a fast-paced story of mystery, mixed motives and murder. It's a great episode! Nathan and Eppy discuss S2E10 2 Into 5.56 Won't Go. Jim's old commander from the Korean war has been killed - but not before leaving a mysterious message on Jim's answering machine that leads the Colonel's daughter to Jim's door. This episode leans a little harder on some generic tropes than we generally expect, but does feature great dialogue and a lot of fodder for our second-half discussion about handling villains, dramatic irony and metaphors in your stories and games! Nathan and Eppy discuss S2E11 Pastoria Prime Pick. Jim's car break down in New Pastoria, and a series of coincidences quickly turn into a plot to charge him with a serious array of crimes - and the whole town is in on it! 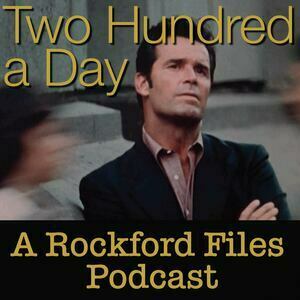 This episode features great pacing and Rockford character moments as the plot unfolds, revealing an all-too-relevant tale of government corruption. To celebrate going to a two-episode-a-month format, Nathan and Eppy take on some listener questions and comments about the show so far! We consider questions about some of our favorite episodes, including The Farnsworth Strategem and Chicken Little is a Little Chicken, and then tackle an existential question: what is a "typical" episode of The Rockford Files? Nathan and Eppy discuss S2E13 The Girl in the Bay City Boys Club. Jim goes to Bay City to investigate a crooked poker game, but quickly gets caught up with a rogue DA, his idealistic assistant Kate, and the mob. The only episode directed by James Garner, this one surprised us with subtleties as it delighted us with dynamic chases!